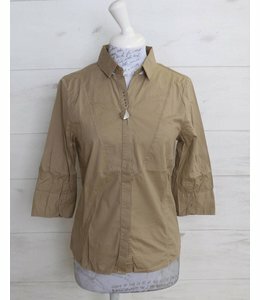 Casual, tailored, short denim jacket, taupe, with various fabric insets. Both of the jacket's side panels have a stretch fabric inset. It is decorated with blue visible seams as well as various handcrafted buttons. Basic top in taupe, with wide straps. The neckline is embellished with various accessories.